A new study suggests that the surge in nicotine test use by employers may not be uncalled for, even as it pertains to young adults. Arterial stiffness was measured in smokers and non-smokers, ages 18 to 30, at rest and post exercise. 5-6 a day smokers were asked not to smoke for 12 hrs before their first exercise test. Before the second exercise test, smokers were allowed one cigarette. Before the final test, they were asked to chew a piece of nicotine gum. What were the results of this scientific nicotine test? Post exercise, arterial stiffness in non-smokers decreased 3.6 percent. But smokers' arterial stiffness increased 2.2 percent after exercise. Keep in mind, they hadn't had a cigarette at this point. Once they did, arterial stiffness increased 24.5 percent. This test is significant for nicotine tests and some of our perceptions about young people smoking. It seems that some people believe smoking when you are young is harmless, as long as you intend to quit. Yet this study shows that it is not - artery health is affected, especially in relation to exercise. Detecting nicotine in the urine is done by detecting its byproduct, cotinine, through a urine-based tobacco test. 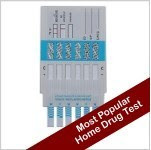 Businesses, parents, and schools can purchase these tests online by clicking on the nicotine tests page at Home Health Testing. As more and more studies roll in that affirm the harmful effects of nicotine on the body, it would seem nicotine testing is here to stay.